This year’s Eco-Fiesta, a few days ago, was much like those of previous years: a lovely day in the park with all sorts of loosely ‘greenie’ and ‘alternative’ people and organisations. I wrote enough about the 2014 and 2013 events that I shouldn’t need to present an overview this time, so I will dive straight in to the things which caught my attention. Wildlife Queensland had a well-staffed stall featuring a great gallery of flying fox photos. These animals get a bad press and need all the support they can get. North Queensland Regional Plan had a very boring stall (I’m sorry, but it’s true!) which tried to engage visitors in planning for our region, the local government areas of Charters Towers, Burdekin Shire, Hinchinbrook Shire and Townsville. It’s a state government initiative and welcomes online input here. I told them about our declining rainfall. What’s your concern? Queensland is likely to get its first large scale wind farm after the regional electricity utility, Ergon Energy, offered a 12.5 year power purchase agreement for the 170MW Mt Emerald wind farm. The wind farm, to be located about 50kms south of Cairns, is owned by Port Bajool and Ratch Australia Corporation, and was one of seven wind, solar and biomass projects short-listed by Ergon Energy in a tender for new renewable energy last December. The other projects were two solar farms proposed by Spanish group FRV, another solar farm from Lyon Infrastructure, Infigen Energy’s 75MW Forsayth wind farm, and a biomass project proposing to generate power from chicken pooh. … The spokesman would not reveal the PPA price, other than to say that Ergon was “very happy” with the deal. DEVELOPERS behind Queensland’s largest wind farm expect to break ground on the Tablelands project early next year. Ergon Energy has announced it will enter into an agreement to purchase all of the electricity generated by Mt Emerald Wind Farm, to be built at Walkamin, through to the end of 2030. The $360 million project is a joint venture between Ratch Australia and Port Bajool. … Mount Emerald includes up to 53 turbines to potentially generate enough electricity to power 75,000 homes each year. Of the 3500 megawatts (MW) of wind generation capacity currently in the country, Queensland only supplies around 12MW from wind farms at Ravenshoe and Thursday Island. The wind farm’s own website has more information including a map.Walkamin is halfway between Atherton and Mareeba, and the wind farm will be just West of it. CONSTRUCTION on the Tablelands’ Mt Emerald wind farm is expected to start in Dec­ember, following the selection of preferred contractors for the $360 million project. Developer Ratch Australia has awarded its wind farm contract to Dutch manufacturers Vestas and the Sydney-based Downer Group. Vestas and Downer will share responsibility for the ent­ire 180MW project, including supply and construction of more than 50 turbines, a substation, cabling to the grid, civil and electrical works, and wind monitoring equipment. The announcement follows Ergon Energy’s decision to purchase all of the electricity generated by the wind farm through to the end of 2030. Congratulations to all concerned! It’s great to see our local supplier moving in the right direction. Let’s hope they follow up this project with many more. 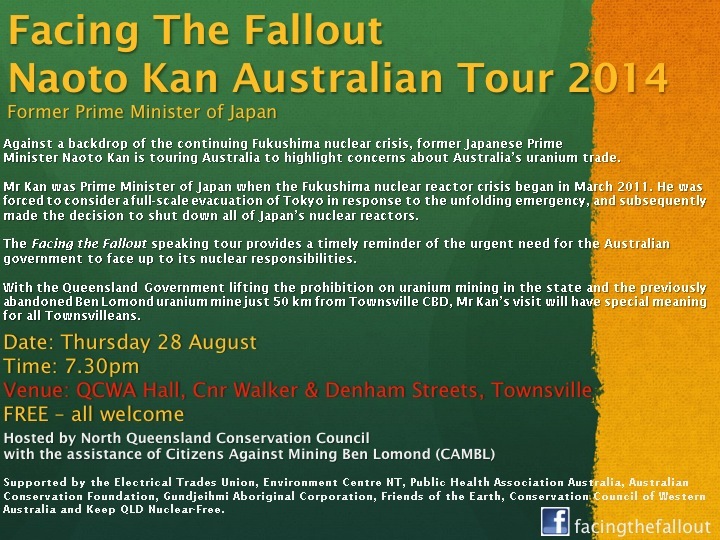 Naoto Kan, who was Prime Minister of Japan when the tsunami struck in March 2011 and knocked out the Fukushima nuclear power plant, visited Townsville last week on his Australian tour. His theme was that nuclear energy is inherently, unavoidably, dangerous and that we should learn from the near-catastrophe three years ago and pursue renewables instead. The Townsville Bulletin interviewed Mr Kan while he was in town (click here to see their article) and ABC News covered his meeting with indigenous people near the Ranger mine and spoke to him about the Australian uranium trade; SBS also covered his visit. After Mr Kan spoke to his attentive Townsville audience, local people took the lectern to talk about the nearby Ben Lomond uranium mine and why re-opening it was such a bad idea. Bill Laing, Managing Director of Laing Exploration Pty Ltd, Townsville-based international mining consulting company, presented an expert overview of the mining technology and concentrating process, with special attention to the risks in relation to the Burdekin River catchment; David Sewell of CAMBL then spoke about the political side of things. The audience didn’t need much convincing, actually: common sense and common local knowledge are enough to tell us that a tailings dam 50km from Townsville is clearly very risky in the light of our frequent cyclones and the regular problems with Ranger mine’s dam (and the nickel refinery’s tailings dam at Yabulu, for that matter). The fact that any leaked radioactive material will be carried down Keelbottom Creek into the Burdekin, the main water supply for Charters Towers and the backup water supply for Townsville, merely adds weight to the obvious conclusion that the mine should never re-open. NQCC was the host for the event and was supported by CAMBL, Citizens Against Mining Ben Lomond. NQCC will no doubt have more to say on these issues, as will CAMBL.